The first illustrations that greet the eyes are the ones on the book's jacket. The cover features the Jamaica dogwood (Piscidia erythrina or P. piscipula) and the spine, the Tiger lily (Lilium spp.) both from the collections of the Missouri Botanical Garden Library. Each chapter is preceded by double-page spread and single-page illustrations. For example, Chapter 3: Exploration 1650-1770 opens with a two page spread of the Chinese primula (Primula sinensis)** followed by a single page illustration of the bird-of-paradise (Strelitzia reginae). From the latter image you can see why the plant was thought to resemble a bird. Sections are organized by plants that represent the chapter's theme. Each section has a facing page illustration of its respective plant. Thus, for Chapter 3, the featured plants are tobacco (Nicotiana spp. ), tea (Camellia sinensis), coffee (Coffea arabica), peppers (Capsicum spp. ), and cinchona or fever-tree (Cinchona officinalis). Within chapters there are other illustrations such as of important figures, social milieux, artifacts, and ethnobotanical products. An example is of a vessel of immature opium seedpods that were dispensed as "medicine as recently as the early 20th century" (page 205). The illustrated time line at the start of each chapter is a creative way of providing an overview of the period under discussion. Here is an example from Chapter 6: Science 1900 - Present (pages 220-221). Two plants - corn and soy - seem to be missing from the last chapter of the book, Science 1900-Present. According to the food media, corn and soy account for much of the modern American diet. There is mention but no substantive discussion of the development of high fructose corn syrup in the 1970s and the use of corn in ethanol. Finally, in addition to desiring garden spots that would allow me to cultivate most of the featured plants, this botanical volume made me want to spend time in the Missouri Botanical Garden Library! Did you know that the Missouri Botanical Garden is "the nation's oldest botanical garden in continuous operation and a National Historic Landmark"? 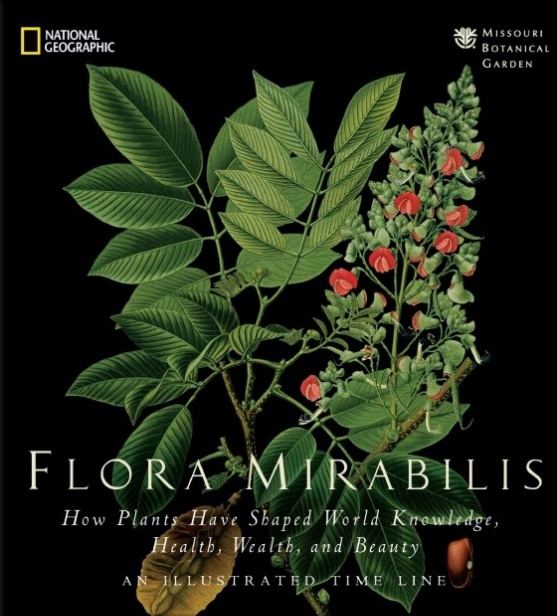 *** Flora Mirabilis is available wherever books are sold. * Also thank you to Anna Kukelhaus of NGS. ** Pardon the quality of the images. With the exception of the first image, they were scanned with a 8.5 x 11 desktop scanner. To enter to win a copy of Emerald Cities by Joan Fitzgerald, simply answer the following question in the comments section of the original post: What sustainability projects are being pursued by your city or town? Entries close at 11:59 p.m. on Tuesday, May 11, 2010. We will select one random winner from all the entries.